Referred to by the late Jerry Wexler as one of the men most responsible for the Southern Rock sound that came out of Macon, Georgia, in the ’70s, Johnny Sandlin’s music career began in the early ’60s playing with other musicians who went on to leave their mark in music history including Dan Penn, David Briggs, Norbert Putnam, Jerry Carrigan, Roger Hawkins, David Hood, Eddie Hinton and fellow HourGlass band members, Paul Hornsby, Pete Carr and Gregg and Duane Allman. When the HourGlass broke up, he became staff drummer for Tone Studio in Miami but soon moved to Macon where he again joined the Allmans, first as the drummer in the Capricorn studio rhythm section and then as recording engineer, producer and vice-president of Capricorn Records and head of A&R. Sandlin also produced, mixed, and mastered albums for the Allman Brothers Band, Gregg Allman, Gregg and Cher, Richard Betts, Johnny Jenkins, Elvin Bishop, Wet Willie, Bonnie Bramlett, Alex Taylor, Cowboy, Delbert McClinton, Widespread Panic and many others. Since leaving Capricorn, Johnny works as an independent engineer and producer, is co-owner of Rockin’ Camel Records, and continues to record in his own studio, Duck Tape Music, in Decatur, Alabama. His work has earned him five platinum and ten gold albums. Johnny Sandlin is truly the unsung hero of Southern rock—an absolutely amazing record producer and musician with a true gift and an impeccable ear for music. This memoir from Anathalee Sandlin is a real page-turner for those of us who recall with fondness the hey day of Capricorn Records and the birth of Southern rock in Macon, Georgia. This is a story that truly needed to be told. 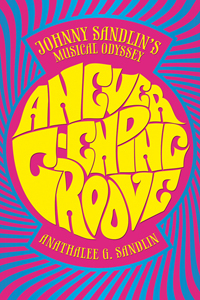 Never-Ending Groove is a non-stop read; packed with amazing insights and provocative anecdotes, Johnny Sandlin's saga takes us back to where it all began for Southern rock. If you are a fan of southern music, more especially the music that came from Capricorn Records during their 70s heyday, when the Allman Brothers Band was at their zenith, then you will enjoy A Never Ending Groove. It is truly an insider's view. Duane Allman gets a lot of credit for creating the “Southern rock” and “jam band” movements with the formation of the Allman Brothers Band, but Johnny pre-dates the band, having been friends with Duane and Gregg Allman during their days in competing bands on the Chitlin' Circuit. They eventually joined forces to create Hourglass, and their shared experiences produced a deep friendship, eventually leading to his engineering and producing rolls behind the console at Capricorn Recording Studios. Johnny is as much a part of the Capricorn legacy as Duane Allman himself. Very informative and entertaining. A must read for all fans of The Allman Brothers Band, Southern Rock, and recorded music in general. Johnny is the gentle giant of Southern Rock. His contributions have shaped the music of the South for decades and those of us that have been privileged to work with him owe him a huge debt of gratitude.